Headed over to East Cafe in Rustan's Makatiwith some blogger friends for the launch of Infinity Kose. Kose was established by Mr. Kobayashi in 1946. His business philosophy is to spend more on research rather than advertising. This holds true with Kose's products until the present. Did you know that Kose is responsible for developing the first ever beauty serum, 2 way foundation and fresh concentrate? Kose is an innovator in the beauty/cosmetics industry. "We must treat our skin like Silk!" Our skin is not like cotton or polyester, it is like silk and therefore we must handle it with utmost care. Kose Infinity is a luxurious, high-end skin care line that delivers their promise of better looking, youthful skin, right after your first application of the product. Kose is unlike any other facial skin care product I have tried. The texture alone feels expensive. Their Oil Cleansing Cream which is a genius at removing all traces of even the toughest eyeliner with just one wipe, is at first a cream and then transforms into the lightest oil after a few seconds. I can't find the words to accurately describe it's texture but if this makes any sense at all, it sort of felt like a "water-based oil". That's innovation that only the Japanese can pull off flawlessly. 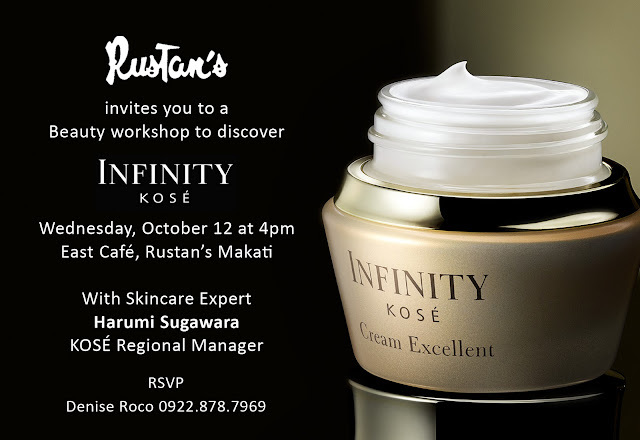 Infinity Kose and other Kose products is available in all Rustan's Department Stores Nationwide.